With so many options available in the marketplace for student loans it can quickly become overwhelming. Fortunately, services like iHelp take much of the guesswork out of the equation. Owned and operated by the Student Loan Finance Corporation, this company has been serving students and their families since 1978 and continues to maintain its pristine A+ rating from the Better Business Bureau. It's also one of the companies that use Credible. We love Credible as a comparison tool because you can compare all different student loan refinancing in seconds. Plus, College Investor readers get up to a $1,000 bonus for refinancing with Credible! iHelp offers two different avenues for their student loans. One type serves the currently enrolled or soon to be enrolled student, while the other type is for graduates who are looking to consolidate as much of their unwieldy student debt as they can. The application process to begin your search for a loan can be performed at any local branch of any of their participating institutions or online. 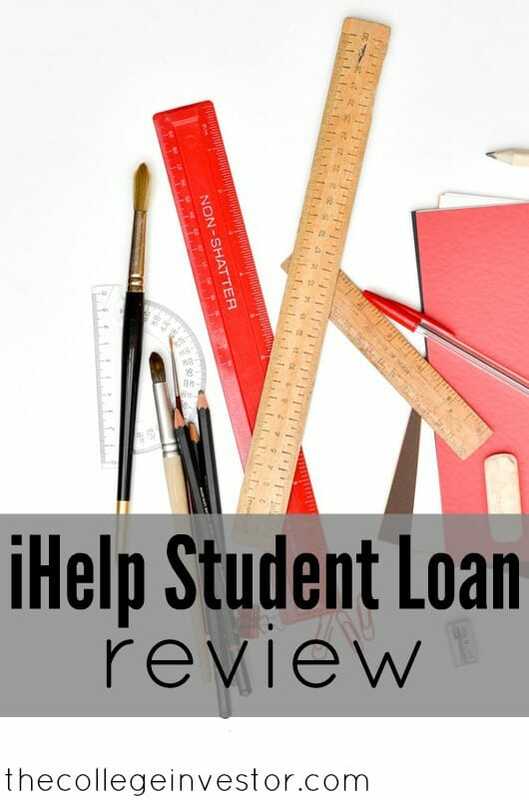 Check out our full iHelp Student Loan Review below. By using the iHelp application process, it allows students and parents to complete the paperwork and see if they can actually qualify for a loan at a particular institution, without the hassle of doing it several times for several different lending institutions. The iHelp site operates throughout the entire United States of America and is easily accessed when trying to determine what interest rate you may qualify for. To be eligible for the pre-qualification process, you, or a co-signer, must have at least three years’ worth of a viable credit history and must have a monthly income of at least $1,500. Undergraduates can get anywhere from $1,000-$100,000 and graduates can get up to as much as $150,000. In Georgia, however, there is a minimum loan requirement of at least $3,000. Consolidation loans begin at $25,000 and can range to $100,000 for undergrads with graduates being able to tap in to as much as $150,000. If you meet iHelp’s initial requirements, you will be turned over to one of their affiliated institutions like Citizen’s Bank. Applicants must also be of legal age where they live and have had a yearly income of at least $18,000 for three consecutive years. In addition to the three years of a credit history, the potential borrower must also have a debt to income ratio of less than 45%. Borrowers with cosigners can have the cosigner removed from the loan after making payments on time for 24 straight months. When you refinance with iHelp on Credible, everything is taken care of by Credible and you don't need to worry about the behind the scenes stuff of loan financing. iHelp also offers private in-school loans. These loans are variable rate only, and are for a 20 year term. Currently, those rates start at 3.89% APR. iHelp is a great potential search tool for finding student loans that work for you. However, we think that Credible is a better way to compare, as they make the process smooth from end to end. Remember, always compare your lenders at Credible before getting a student loan. And don't forget that College Investor readers get up to a $1,000 bonus when they refinance with Credible. You will probably need a cosigner. 90%+ of private loans require a cosigner. $8,000 is also manageable via work, scholarships, and more. IHELP WORST PRIVATE LOAN COMPANY! Background History: I had just graduated from college with my Bachelor’s in Biology and was ready to take the next step in my career by applying to a private health institute. The next step into any career whether its going to a graduate school or obtaining a Doctorates degree has to be funded through loans. What many school fail to educate students is how financial aid is no longer available once your reach a certain degree and the only way to fund your education is through loans. Unfortunately, the school I wanted to attend was not accredited until the following year and the only way to fund my education was through private loans. Fun Fact: Private loans can give you a lower interest rate than federal loans. I came upon the organization called iHelp. I was approved for a loan at the beginning of the month of June, 2018 where I had signed everything and was ready to take the next step in my career. But on June 11, 2018 I was informed through my future classmates that iHelp is no longer associated with the school??? In fact, I never received a call about their current situation and In a matter of a month iHelp issue with their type of insurance in the state of Florida has ceased all loans.. . DO NOT ATTEMPT TO APPLY FOR A LOAN!!! I REPEAT DO NOT ATTEMPT TO APPLY FOR A LOAN!!! My current status on iHelp says (Pending 1st disbursement), but my status online says on hold. When I call customer service they simply state “that it is not up to them anymore to make the decision on whether or not I will receive the funds, but up to the bank”. I then ask if they have a deadline because I start school on July 30th and over several employees reported to me saying ” we don’t know when they will have an answer, they have no deadline”. I then presumed to ask the question if I could speak to the bank personally? Of course, they stated ” We cannot give you any information”. IHelp lack of responsibility with their new “insurance” has put hundreds of students at risk towards their education. If you plan on investing your future with them, do not. Try any other loan company and do your research if they expect on any changes in the upcoming future. Learn from my mistake, and never invest in IHelp Private loan company. Until then I wait and pray for a miracle.